Heather Wade grew up in the foothills of Bountiful, where a home's square footage measures in the thousands. Now a St. George resident, Wade wanted a house but didn't want to be house poor. 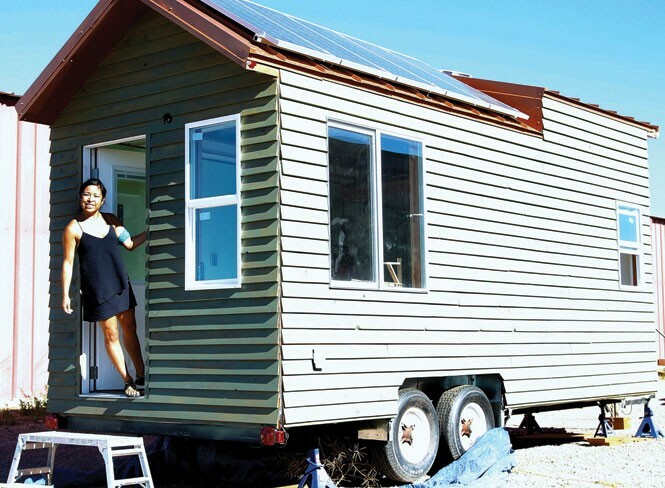 After learning about the tiny-house movement, she found the solution in the form of a 160-square-foot house. Wade, a graduate of Southern Utah University, spends most of her time outdoors or traveling for her work in the blood-collection division of the American Red Cross, so the small space was appealing. Thanks to the help of friends Erin Elder and Ryan Bingham, both SUU civil-engineering students, her house was recently finished, and Wade will move in September. Her house will stay in RV parks until Wade finds land to accommodate it. My dad was encouraging me to buy a house. I started looking at houses, but was so turned off by the homes I saw. Every house looked the same. I was very turned off by the idea of owning a home, the maintenance on a home, being in debt on a home. I came across the tiny-house movement, and it was exactly what I needed. I own my house outright; it is a pretty cool feeling to own your home. Don't you think you'll eventually need more space? I don't need much more than a bedroom. I don't want to get married or have kids. I don't want all these empty rooms that I have to fill with stuff; you end up constantly purchasing things. When you have a small space, there is not a whole lot you can purchase because there is not a lot of room to put things. You are saving money, which can go to other things like traveling or helping friends and family when they need it. There is more of a sense of freedom. I didn't want to be one of those people confined to their house because they have to be spending their Saturdays doing yardwork or cleaning their home. Whereas for me, it will take me a few minutes to clean my house and I'm out the door. I won't be in debt; in fact, I don't have any debt. The house is being built by me and engineering students; none of us have any sort of construction experience. It has been a lot of trial and error, frustrations with each other and the house itself. Everything we have worked on has been a challenge, because we didn't always know what we were doing. I haven't had a free Saturday in a very long time; every Saturday is dedicated to working on the house. Working on the house, I've been the most stressed I've ever been. What have you learned form this experience? For me it is the more simple the better. Downsizing and getting rid of a lot of my things has felt like a huge weight off my shoulders. I know that not everyone can live that way, but for me, I don't feel like I'm sacrificing a lot of things. This is something I want to do. There is a sense of pride putting your blood, sweat and tears into your own home. What advice would you give someone considering a tiny house? Not everybody can live small. Be sure this is something you want and that you are passionate about. People who think they can just experiment with this tend to not stay in a tiny house long. If this is something you want, and you think might make you happy, then do it. For Salt Lake City's downtown to thrive, it needs to reclaim its dead zones.